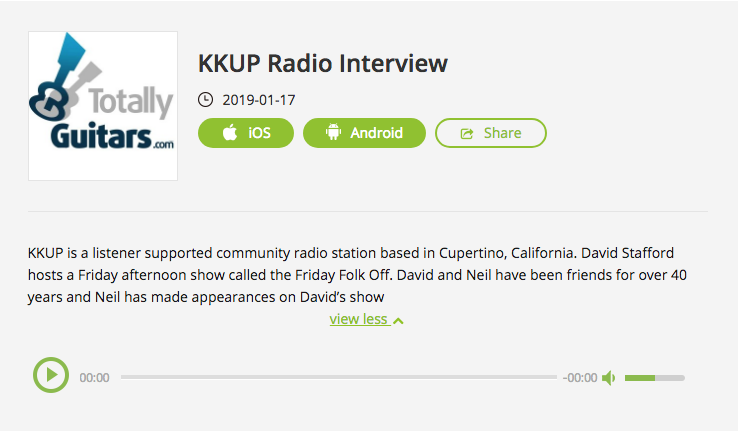 KKUP is a listener supported community radio station based in Cupertino, California. David Stafford hosts a Friday afternoon show called the Friday Folk Off. David and Neil have been friends for over 40 years and Neil has made appearances on David’s show a few times over the years, although the last was in 2001. They talked about old times and new times, and Neil played some tunes, including Blues Land, Sylvia, Josie, White Bird, Hula Blues, and Last Train Home. Some went well and a couple flew off the rails but a fun time was had by all (or at least both).